Sweet potatoes are my favorite vegetable. They’re so versatile and rich! It’s my personal truth that sweet potatoes can make almost any dish better. They’re also super good for you – packed with vitamins and minerals – so that’s a win-win situation in my book! I hate it when I’ve found a recipe on pinterest that I want to try, but the blog post is super long and it only barely relates to the recipe (if it relates at all). So all I’m going to say is that this is my favorite chili recipe. I make variations of this chili at least once a month during fall and winter. It’s also very good with a pound of ground beef instead of chicken, so if you prefer that.. go for it! This recipe makes a lot of Chili – I can usually get 8-10 servings out of it. If you’re not feeding a crowd though, it freezes & reheats really well! 1. Sautee onions and garlic in olive oil in a large soup pot, until onions become translucent (about 5 minutes). 2. Add sweet potatoes, zucchini, diced tomatoes (including liquid), black and white beans (including liquid), broth or water, chili powder, cumin, salt, orange zest, and a dash of cinnamon. Bring to a boil, cover and lower heat to simmer for 20-30 minutes or until sweet potatoes are cooked through. 3. In a small bowl, mix cornstarch and cold water until cornstarch is dissolved, then pour slowly into chili while stirring constantly. 4. Add chicken, cover, and let sit for at least 10 minutes. You can serve this chili right after adding the chicken or let it sit for up to three more hours on the lowest heat setting. The longer you let it simmer, the more flavorful it will be. 5. Serve with cornbread and your favorite toppings. I suggest sour cream (greek yogurt or goat cheese are good subs for this), shredded cheese, jalepenos, and those big scoop Fritos. Okay, you won at the recipe post! Not too long, not too short, and great photos! For someone who is just starting out you’re doing an amazing job! This inspires me to experiment with summer chili when in gets warm. 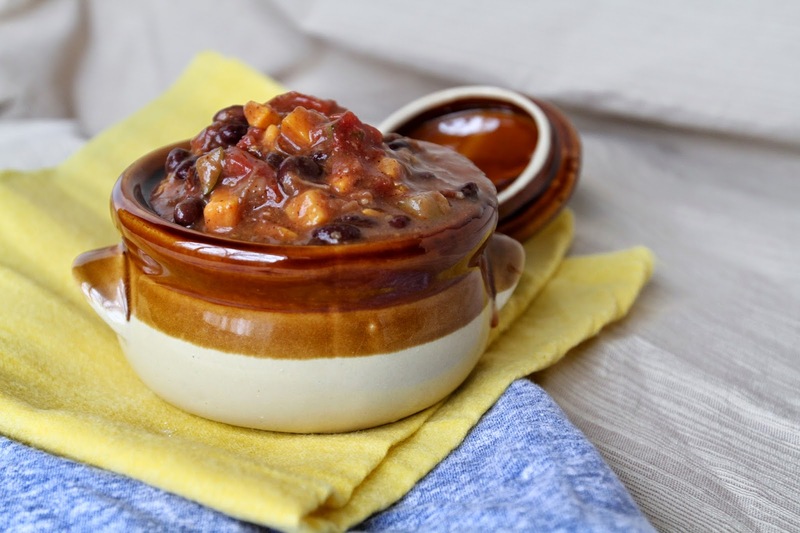 (I love chili but it’s such a hearty fall/winter food.) Sweet potato, zucchini, ground turkey, corn? I made a chili with butternut squash a couple months ago and it didn’t quite float my boat, this looks MUCH better. Yum!!! This looks amazing! I’ll have to try it. I used to hate sweet potatoes, and I still can’t eat them certain ways. I can’t stand the texture when they’re “mashed,” it makes me gag. We’ve been slicing them, so they’re in circles, putting a little olive oil, salt, pepper and Parmesan cheese, then baking it. It’s so good! Those are my new obsession! mashed is my least favorite way to eat them, too. those sweet potato crisps sound really good.